The EZ offers a quick 10 minute installation that requires no expensive mechanic labor, no drilling, and no computer downloading. Simply plug the Edge EZ into 2 stock connections and you're ready to go. The EZ provides real power ’you can switch between 3 power levels to add up to 65 HP. The EZ safely provides power to help eliminate downshifting. The EZ is also tuned with a special fuel economy level* that improves the atomization of fuel, which in turn allows Edge to add power, while at the same time delivering between a 5-10% improvement in MPG when driving in level one. Add to that the EZ's price point and you have the ultimate value on the performance market today. There is not another product on the market today that delivers power so safely and so economically, and at the same time is so easy to install. The following power gains are representative of an actual test vehicle. These gains were measured on a SuperFlow Dyno at an altitude of 4400 ft above sea level, and represent power delivered to the rear wheels of the test truck. The only modification made to the test truck was the addition of the Edge EZ module. Power gains may vary based on vehicle and geographical location. Edge recommends the use of gauges when using any performance upgrade. 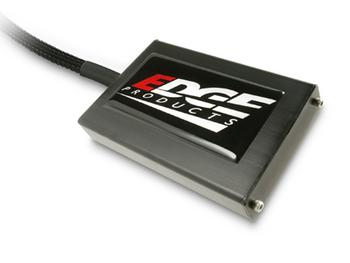 Founded in 1999, Edge Products has become the premier name for aftermarket performance electronics. Initially, the company was built on the production of performance electronics for diesel-powered trucks. Over the years, however, Edge has expanded its offerings to include innovative game-changing products for diesel and gas car, truck, and Jeep markets. Edge has been named three times to the Inc. 500s fastest growing privately held companies, and was noted as Utah's fourth fastest growing company between 1999 and 2004.